Is your smile not as bright as it used to be? Want to change that? 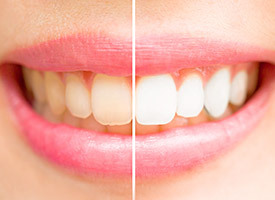 At Robison Dental Group, we can help make your teeth up to EIGHT shades whiter with one of our professional strength treatments. Whether your teeth have been discolored due to coffee, wine, tobacco, or age, we can help you turn back the clock and restore that youthful glow. If you’re ready to have a pristine while smile, give us a call today. Why Choose Robison Dental Group for Teeth Whitening? Discoloration of your teeth can occur over time for many reasons. Eating certain foods, smoking, or even taking certain prescription drugs can lead to staining of the enamel. Teeth can become yellow, brownish, or a dull gray as enamel deteriorates and collects microscopic staining agents. The type and severity of the staining will determine the effectiveness of different treatment options. You have three basic options when whitening your teeth. Careful consideration should be given before you choose a whitening treatment because not all treatments will work for everyone. The first option is to switch to an ADA approved teeth whitening toothpaste. These products are designed to polish the enamel but may be ineffective for badly stained teeth. The second option is to purchase an at-home teeth whitening kit. These are a more effective option than whitening toothpastes, though they can be inconvenient to apply properly and may cause irritation. They are also largely ineffective against persistent stains. The third option -- and undeniably the most effective -- is to visit us here at Robison Dental for professional teeth whitening treatments. To avoid the frustration of time and money wasted on a treatment that doesn’t work for you, contact us today. Dr. Robison and his team can fully evaluate the condition of your discoloration to get you the right treatment the first time. 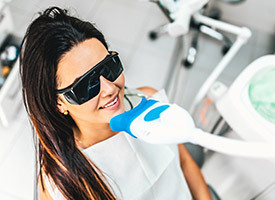 The first step toward a whiter smile is a consultation with our team to make sure that your teeth and gums are healthy enough to undergo whitening treatment. 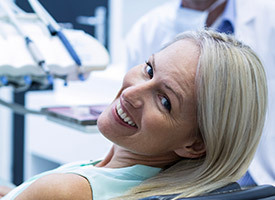 Dr. Robison offers both a single-visit teeth whitening treatment and a safe at-home option. Dr. Robison’s at-home option includes custom-made teeth bleaching trays and whitening gel. These quick and easy solutions are your best choices for getting the bright white smile you deserve.